We have produced a number of papers and books on the geology and natural history of Kauai and other islands of the Hawaiian Archipelago. A principal book deals with the geologic history of the island of Kauai. Professional papers deal with topics such as the origin of limestones along the southeast coast of Kauai as well as the history of drowning deaths in the nearshore marine waters of the island of Kauai. 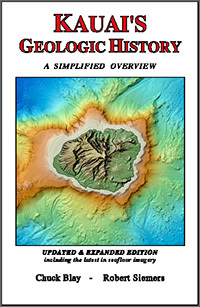 The latest edition of our book dealing with Kauai’s geology is now in print and available for purchase online. As with previous versions, the new offering’s target is broad, ranging from visitors with an interest in the island’s natural history to upper level high school and college level students. The considerably expanded 2013 edition is essentially a complete rewrite of the 2004 version, with over double the content. A considerable amount of new and previously unpublished original material has been incorporated. This edition contains almost 100 pages of full-color illustrations, with expanded easy-to-read captions, and some 60 pages of accompanying explanatory text. Numerous newly acquired, ocean-water-removed images of Hawaii’s deep seafloor surrounding the entire Hawaiian Archipelago, from the Big Island of Hawaii to Midway Atoll, provide spectacular views of Hawaii’s giant shield volcanoes with their relatively miniscule visible island tops. An eight-page glossary provides succinct explanations for nearly 100 geologic and other terms. Over 50 key references are provided for those interested in pursuing the various topics discussed in greater detail. For immediate purchase at our reduced introductory price of $19.95, plus postage and packaging, please contact us.